You have been going to Church these years. You have been attending Bible studies. You have also been serving in different ways for the Kingdom. Does that mean that you have been growing spiritually? What does it mean then to grow? How do we measure spiritual growth? This week, I want to take some time to ponder upon how we measure ourselves and to provide some tips on how to get a snapshot of where we are, and what we can do henceforth. During my varsity days, I remember two popular methods of ensuring we maintain a balance of various spiritual disciplines. The first is P.O.S.B, which I learn from the Christian Fellowship. It's a nice acronym to remember what the basic spiritual exercises we need to do. We need to pray regularly. Even better, to adopt a prayerful life. This makes our relationship with God a dynamic one. In prayer, we can share anything with God. In Outreach, we need to go forth and share the gospel with all, especially non-believers. This enables us to be witnesses as salt and light to the world. In Social, we remember that we are called to form communities of faith, coming together to encourage, to exhort, and to experience the joys of koinonia. We need to read the Bible regularly so that we can let the Word of God guide all of our lives. If we keep all four disciplines well, we are on the way to a healthy spiritual life. 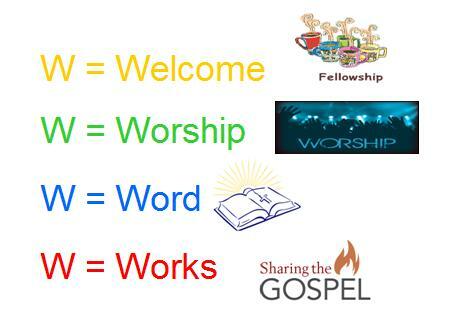 The second model is also a four dimensional picture, which some churches have adopted. That is the 4Ws model: Worship, Welcome, Word, and Works. Although the words are different, it basically highlights the dual-horizontal and dual-vertical aspects of Christian living. Vertically speaking, worship and word is about our upper relationship with God through praying, reading the Bible, and worshiping together. Welcome is about the way we invite friends to walk with us, and works is about our living out of the goodness of God in our daily lives, sharing the gospel in words and in works. "My spiritual life? Well, I read the Bible regularly, I pray as much as I can, and I reach out whenever I can. Socially I think I am strong. Bible and Prayer, I will put myself as average. What is perhaps lacking is my Outreach. That's where I am spiritually." When using the 4Ws, one can summarize the spiritual position likewise. If one can live with all four W-cylinders firing away, one will comfortably say they are healthy. Such models have helped me in the past and they are still popularly used in many Christian circles. Unfortunately, I find them more and more inadequate as the years go by. For P=Prayer, how much praying is a good level of praying? One can pray through the motions and still not feel close to God. For O=Outreach, do we measure in terms of quantity or quality? One can reach out a lot and produce no fruit. For S=Social, how much fellowship do we need and is there really a way to estimate it? For B=Bible, do we use the amount of Bible knowledge we have as a yardstick? One can know lots of Bible, and still be immature. The above models are useful, but they are most elementary. They are easy to remember, but they are not enough. Let me give three reasons. Firstly, the models themselves are mainly focusing on works. Essentially, it tells us that if WE do not do it, we are not growing. It comes from an expectation to do these stuff in order to get something. The underlying assumption is that if we pray so much, outreach so much, read the Bible so much, and socialize so much, naturally we will grow. Where then is the grace of God? Is it not true that our whole spiritual life is a gift for us to cherish and to enjoy? What if we are unable to spend time cultivating these good works? Does that mean we are not growing? Are we then saying that if we DO NOT do all of these works, we have ourselves to blame? Then where is God's role in empowering and energizing us to live humbly, fruitfully, faithfully, and gratefully? Secondly, the models only represent a small part of the Bible. The four aspects of each model will receive the same criticisms leveled at the four spiritual laws of evangelism. Are they not a pick-n-choose kind of a spiritual yardstick? 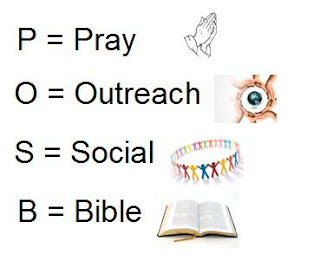 Remember, that whether we use the 4Ws or POSB, they are only representing a small part of the Bible. We have the whole Bible that we have not really applied. Just like reading a summary of the Bible versus reading the Bible itself. The summary only gives you the gist of a certain belief or argument. The actual Bible provides the texts, the contexts, and the whole syntax of the faith. If we still try to adopt the two models even after 20 years of belief, then we are doing ourselves a disfavour. A wrong yardstick can render us measuring ourselves inadequately, just like trying to measure our own height with a primitive stick that only has the feet and the meters, but does not have the finer inches or centimeters in between. The better our measuring yardstick, the more accurate will be our measurement of our own spiritual growth. Thirdly, and more seriously, the disciplines are reflective of an increasingly individualistic mindset. On the one hand, it raises the bar for personal accountability and action. On the other hand, where is the community aspect? Where is the link of one's spiritual life to the rest of the community? If a community is not well spiritually, can an individual in the community dare say his own spiritual life is well? I don't think so. A proper understanding of Christian faith is that the individual and the community is intricately linked to each other. If one hurts, the whole body hurts. If one rejoices, the whole body rejoices. If one fails to grow, the whole body fails to grow. This is an important aspect of the Trinitarian model. On these three counts, the models lose their effectiveness as spiritual yardsticks. There are several models that can be developed from different parts of the Bible. One model is the fruit of the Spirit model in Galatians 5. Another model is the Beatitudes in Matthew 5. We can also use the combination of the Ten Commandments and the exhortation from Paul to live a life of love according to 1 Corinthians 13. There are a lot more. Let me describe one according to 2 Peter 1:5-9. Firstly, the Christian life essentially begins at faith. Without faith it is impossible to please God. In faith through grace, we are made new and given a new leash of life. Such faith is a gift of God, that we can be empowered to "make every effort" as well as to "add" to to "supplement" our faith the various spiritual attributes of goodness, knowledge, self-control, perseverance, and godliness. Secondly, there is a movement from individual to community. Are our spiritual disciplines leading us more inward looking? Then we are not growing. If our disciplines are moving toward becoming more like Christ to one another, we are growing. Just like Jesus who reaches out to ordinary folks in order to touch them. All of these attributes basically provide the foundations of a bigger idea: brotherly kindness. Thirdly, we read about the overall purpose of it all: Love. For me, when I read this passage, there are basically three parts. The beginning is faith. The end is love. Everything else is in the middle leading forward from individual faith to community living. When we are called to faith in Christ, our Christian disciplines must lead us somewhere, and more importantly to Someone. It is never to be an end in itself. Note that we ought to understand the word "knowledge" not in terms of knowing more about God, but knowing God more intimately. As my Professor, Dr J.I. Packer has said, "Knowledge about God is not the same as knowledge of God. We can have a systematic theology of God memorized, and still not grow in our knowledge of God." True knowledge of God is not mere head knowledge. True knowledge means a holistic understanding of theory and practice, head and heart, words and works. When we grow more into Christ, our lives in Christ become Christlike for Christ. Our knowledge in God leads to our living out of this knowledge in God, in increasing measure. Continuously growing is a healthy sign. How then do we measure our spiritual growth according to 2 Peter 1:5-9? Maybe the following questions can give us a fair indication. Is our spirituality based self-motivation or upon faith in God's Word? Is our spiritual growth based on what we do, rather than a response to what God has done? Is our spiritual growth measured primarily in individual terms, or growing in community AND individual terms? Have we grown in brotherly kindness and love? Have we given up trying to find ways to learn, to grow, and to love? Are we content with doing good works, or are we only satisfied when we see Christ, know Christ, and to live like Christ? Perhaps, what we need most is not how well we have done, but what kind of spiritual measurements we are using. Very very impressive article on spiritual development.